DHA (docosahexaenoic acid) is an omega-3 fatty acid found in cold-water oily fish and in seaweed. DHA is also widely available in supplement form. In addition, the body naturally produces small amounts of DHA. Additionally, DHA is purported to prevent cancer, age-related macular degeneration, and Alzheimer's disease. In all stages of life, DHA is required for healthy brain functioning. DHA is also essential to the development of the nervous system in the first six months of life. Studies indicate that DHA may produce a number of other health effects, such as enhanced cardiovascular health. Since DHA possesses anti-inflammatory properties, it's also thought to protect against inflammation-related health conditions. Taking DHA in combination with EPA may reduce several risk factors for cardiovascular disease (including high cholesterol), according to a 2009 report published in Prostaglandins, Leukotrienes, and Essential Fatty Acids. In addition, the report's authors note that taking DHA supplements may moderately improve blood pressure. The report also indicates that people with higher levels of DHA may have a lower risk of atherosclerosis. In a 2009 research review published in the American Journal of Therapeutics, scientists found that regular intake of DHA and EPA may significantly reduce the risk of dying from heart disease. However, the review did not look specifically at the cardiovascular effects of DHA supplements (as opposed to dietary intake of DHA). DHA may help protect against age-related cognitive decline, suggests a 2010 research review from Current Alzheimer's Research. 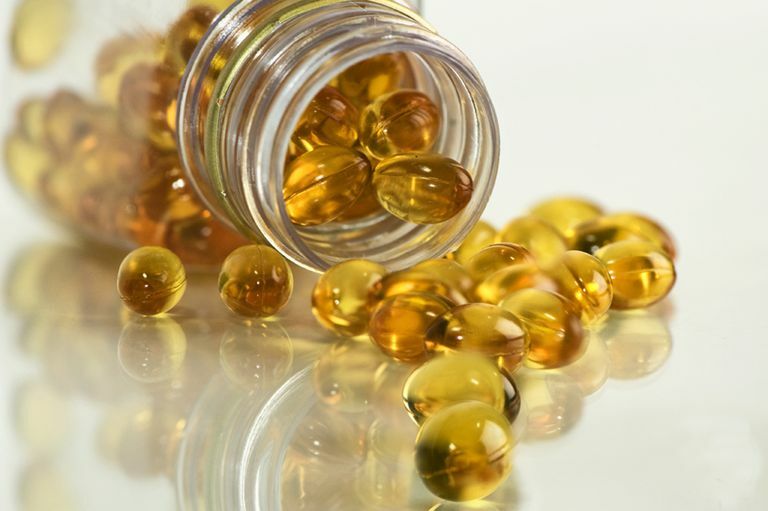 Analyzing data from previously published clinical trials, the review's authors found that taking supplements containing both DHA and EPA may help treat mild cognitive impairment (but not Alzheimer's disease). DHA may help protect against depression, according to a 2010 research review from Biological Psychiatry. Looking at 14 studies on polyunsaturated fatty acid levels in depressive patients, the review's authors found people with depression may be more likely to have low levels of DHA and EPA. The review's authors suggest that DHA and EPA may help reduce depressive symptoms and, in turn, show promise as an alternative treatment for depression. According to the National Institutes of Health (NIH), fish oil is possibly effective in the treatment of several other conditions, including rheumatoid arthritis, menstrual pain, psoriasis, and asthma. The NIH also states that fish oil may help reduce the risk of stroke and certain forms of cancer (including endometrial cancer). However, it's not known whether taking DHA supplements (as opposed to increasing fish oil intake by consuming oily fish) might help produce these health benefits. Although DHA is generally considered safe, taking DHA in the form of fish oil is known to cause a number of side effects, including bad breath, heartburn, and nausea. What's more, there's some concern that fish oil might reduce immune system activity and weaken the body's defense against infection. In addition, taking fish oil in combination with certain medications (such as blood pressure drugs) may produce harmful effects in some cases. Therefore, it's important to consult your physician before combining fish oil with medications. Widely available for purchase online, DHA supplements are sold in many drugstores, grocery stores, natural-food stores, and stores specializing in dietary supplements. Eicosapentaenoic acid (EPA) is another omega-3 fatty acid found in fish oil. Many dietary supplements contain a combination of DHA and EPA. Regular intake of DHA is important for preserving brain health. Consuming cold-water oily fish (such as salmon, mackerel, herring, and sardines) several times weekly may help you achieve optimal DHA intake. If cold-water fatty fish isn't part of your regular diet, talk to your doctor about finding a DHA supplement that's right for you. While taking DHA supplements may offer certain health benefits, it's too soon to recommend DHA as a treatment for any condition. It's important to note that DHA supplements should not be used as a replacement for standard care of a chronic condition. Avoiding or delaying treatment for a chronic condition in favor of self-treating with DHA may have serious health consequences. Holub BJ. "Docosahexaenoic acid (DHA) and cardiovascular disease risk factors." Prostaglandins Leukot Essent Fatty Acids. 2009 Aug-Sep;81(2-3):199-204. Lin PY, Huang SY, Su KP. "A meta-analytic review of polyunsaturated fatty acid compositions in patients with depression." Biol Psychiatry. 2010 Jul 15;68(2):140-7. National Institutes of Health. "Fish oil: MedlinePlus Supplements." January 2011. Saremi A, Arora R. "The utility of omega-3 fatty acids in cardiovascular disease." Am J Ther. 2009 Sep-Oct;16(5):421-36. Yurko-Mauro K. "Cognitive and cardiovascular benefits of docosahexaenoic acid in aging and cognitive decline." Curr Alzheimer Res. 2010 May;7(3):190-6. Can Kava Provide Anxiety Relief?